Many years ago, it was a common practice to teach children crafts. Of course during those days many of the things children learned were not considered crafts. They were necessary tools that were functional and kept a family warm. But as we have become a society of less time and more resources, children are not usually taught some of the basic skills that our forefathers (and mothers) needed to learn to survive. Truthfully, because I was a latch key kid, my mother never had the time to teach me many of the things she had learned herself. I learned to sew in Home Ec in High School. I learned how to cook after I got married. And I learned how to quilt because it was a new hobby that caught my interest. I've always loved to put puzzles together, and quilting brought together the math and the beauty of color. In a recent blog post, I shared with you how I had taught my friend to quilt, and she in turn taught one of her friends. In the same respect, teaching kids to do something you love, is a way of passing on to the next generation a love that will hopefully be carried on yet again. 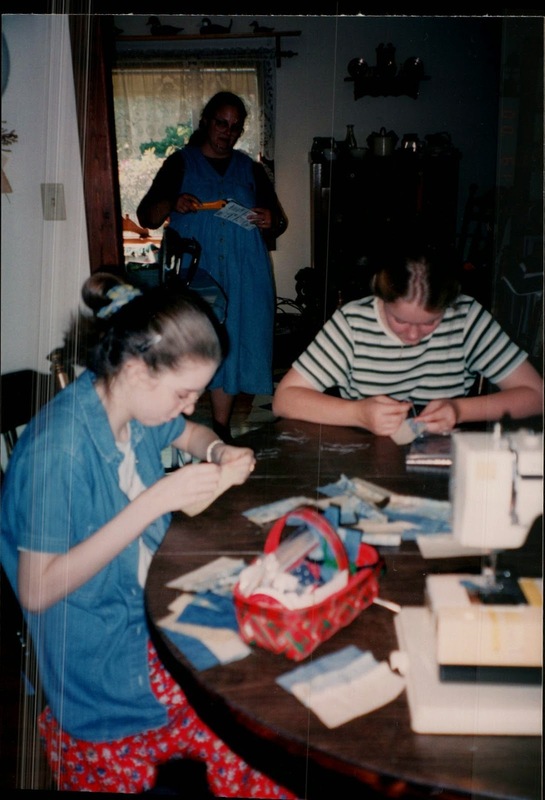 Several years ago I met with my daughter and her friend as they wanted to learn how to make quilts. The reason they wanted to make quilts was because they had a desire to help with a cause. They saw a need and thought the best way they could help was to design and stitch a quilt for every fallen soldier during the beginning days of the war in Afghanistan. It was a monumental undertaking. Especially for two young girls. My daughters friend and her mother took the reigns of this project for several years. Their effort touched the families of hundreds of fallen soldiers. 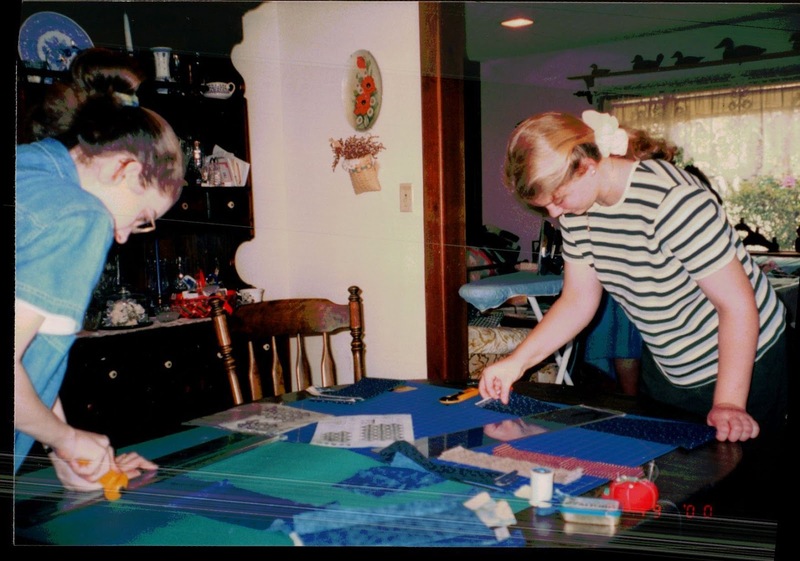 Operation HomeFront Quilts was eventually passed on to military wives but the effort and beginning was started by the stirrings of two young girls who wanted to do their part. So whatever it is you love, you can share it with a child or young person. 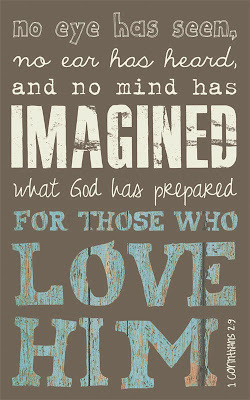 It can become the catalyst of something that goes on far beyond our little world. Let's keep passing it on. Did someone mention a giveaway! Fat Quarter Shop is one of the generous sponsors of It's All About the Kids. As a jump start to stir your interest in helping to pass it on, FQS is offering a $25 Gift Certificate during this fun blog hop. All you have to do is leave a comment on this blog post. I will leave the giveaway open until Saturday November 1st. Please be sure that I have a way to contact you. You can find an easy quilt pattern to start with at Cluck, Cluck, Sew. I love Allison's patterns and have made several in the past. I'm happy to join SewCalGal for It's All About the Kids. Please be sure to stop by SewCalGal everyday and find out what other fun ideas are being shared. 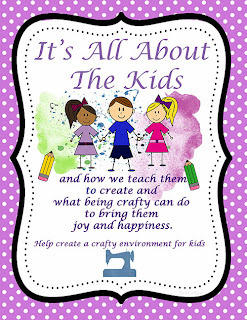 This week SewCalGal is hosting a Blog Hop called It's All About the Kids. Be sure to check every day as she focuses on kid friendly projects, products, tips, tutorials, and inspiration for a variety of crafts. Here is the line up of where to find daily links to blogs that are participating. And did I mention giveaways! SewCalGal wants to thank the sponsors of the giveaways. In addition, there may be giveaways at some of the participating blogs. Be sure to check it out! So I thought I would share a few of my favorite fall quilts with you. If they look familiar, just smile and say, oh wow, how nice. Pretty soon I'll have this computer thing all worked out. Maybe. Several years ago I taught my BFF how to quilt. She had been down to Florida and was only stopping by my house for a day or two. But we managed to get the basics down and she has been a fantastic quilter ever since. But you know the really best part about teaching someone how to quilt, is when that person passes it on to yet someone else. And that is exactly what happened. My friend taught a friend of hers and, as the saying goes, the beat goes on. Except to say that these ladies have far exceeded my ability. I have always been a simple quilter. I like to make traditional style quilts in basic patterns. But get a glimpse at what the next generation has already produced. Now I want you to know that this lady, Michelle, designed and appliqued this quilt for my friend. Each branch of the tree bears the names of my friends children and grandchildren. This is by a lady who has only been quilting for 2 or 3 years! So get busy people, and pass on your gifts. It's amazing to see where the pathway will end up. While I was visiting my BFF, we worked on a few projects together. I've been using the beautiful Island Batik fabrics. I can't show you everything, just yet. They are Christmas presents for a few little princesses. But it was fun making these little bags. My BFF has a lovely sewing room, so this is where we worked on projects together. I miss having a sewing buddy. So it was fun to work along side my special friend. Just a few more quilts to share. I don't often get to quilt shows, so I'm thinking some of you are in the same situation. I love to see what other quilters are doing, so I will share the last of the quilts from the Ohio show. And this one was my favorite!! Okay, here are a few more quilts from the Ohio Quilt show. These were seasonal quilts. Although not quite seasonal, I thought I'd add this one. It could be for any occasion. I have a few more pictures to share next time. My friend in Ohio is also a quilter. So of course we needed to visit a quilt show! There were some very lovely quilts represented, which I will share some pictures with you over the next couple of days. Of course we needed to start out with a signature Ohio quilt. These quilts were made using beautiful Batik fabrics. Last week I enjoyed spending a few days with my BFF in Ohio. Over the years we have visited each other about twice a year. We often work on quilting projects and just enjoy time together. I will show you what we worked on next time. But my friend took me to a fabulous restaurant for lunch one day, that I wanted to share with you. The Pine Tree Barn was a store and a restaurant. We had to taste their famous Lemon Muffins. and the view from the veranda. Although fall was not in full swing in Ohio while I was there, a few colorful trees graced the streets. Next time I'll share what we worked on. Christmas projects in the works.